This sturdy mouse pad protects desktop surfaces and provides more physiologic hand/wrist positioning, allowing you to seamlessly use your desktop PC mouse at ease. 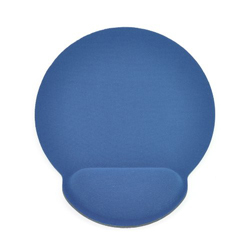 The Gearhead MPWR4100BLU Mouse Pad features a non-slip design and a memory foam wrist rest. It is compatible with both PC and Mac.